If you think of the unpretentious tension rod as something that does little more than hold up curtains, think again. These simple rods are quick to install and generally leave no mark when you take them down, so they function well almost anywhere. Read on for a whopping 25 creative and unconventional uses for a tension rod, beyond holding up your shower curtain. Under-sink storage is often a black hole, the place where cleaning supplies go to be forgotten. Add in a garbage disposal and water filter alongside spare parts, all of which get jammed into tight quarters, and it’s no surprise that most under-sink storage is a cluttered mess. But the solution can be simple: Just brace a tension rod across the cabinet box, and then use it to elevate spray bottles, rags, and other cleaning supplies. Every workshop needs close-at-hand rolls of tape, such as transparent tape beside crafting tables, painter’s tape for paint or stain projects and duct tape (for everything else!). Here’s a dispenser that uses a toilet paper holder, which is essentially just a small tension rod, between the holder arms. Just scale up the build to a full-size tension rod and you’ll be able to hold an assortment of types and sizes of tape. Or, keep it simple for a smaller-scale dispenser. 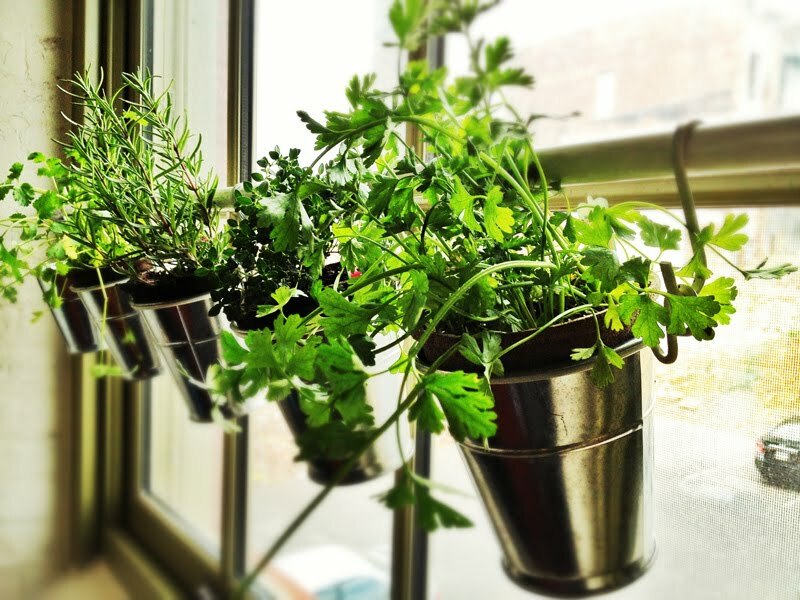 Turn any window into a classy herb garden with just a tension rod and some S-hooks. Don’t hesitate to paint the hardware to match your window or overall decor, and give some thought to which window to set up as your garden—a southern exposure will usually give plants their best shot at survival. Lastly, don’t forget that the pots, plants, and soil will carry a fair amount of weight. It’s a good idea to support the rod, even with something as simple as a bottle cap. If you, or someone else in your home, has a collection of shoes eating up precious closet space, use a few tension rods to get the high heels off the floor and display them in a tidy fashion. This trick works great inside the closet itself, or as shown here, in a convenient dressing room nook. If your shoe collection goes beyond high heels, consider making this DIY floating shoe organizer this weekend. There’s nothing more adorable than a kitten. And there are few things more unpleasant than having to see that kitten’s litter box. Use a tension rod and some spare fabric to give your cat’s litter box some privacy and a sense of style. If this project sounds like your kind of DIY fun, here’s another 40 perfect pet projects to show your pet some love. Most tension rod installations involve spanning a horizontal distance, but this clever display makes the most out of small floor space by taking the storage in a vertical direction. 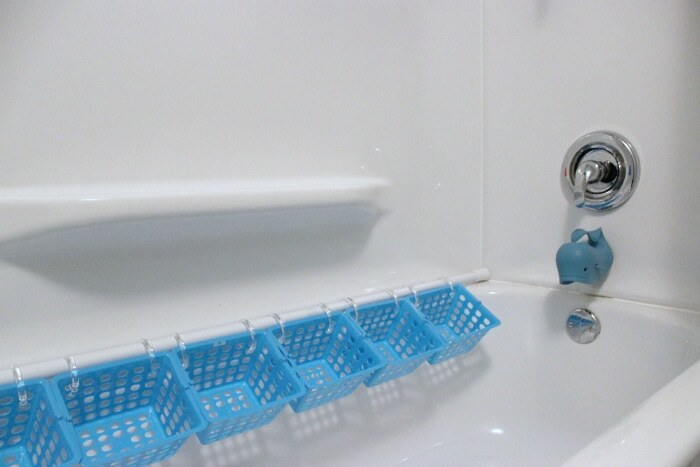 Often seen used in shower caddies, this approach is also a good fit for garages and pantries. In fact, it’s an especially great solution for renters or home-owners who want off-kitchen storage, but don’t have a full room designated as a pantry. It’s a basic law of nature: whatever cookie sheet you need is sure to be at the bottom of the stack. It would clearly be more convenient to store flat items like cookie sheet and cutting boards on their side, so that they’re all readily available. 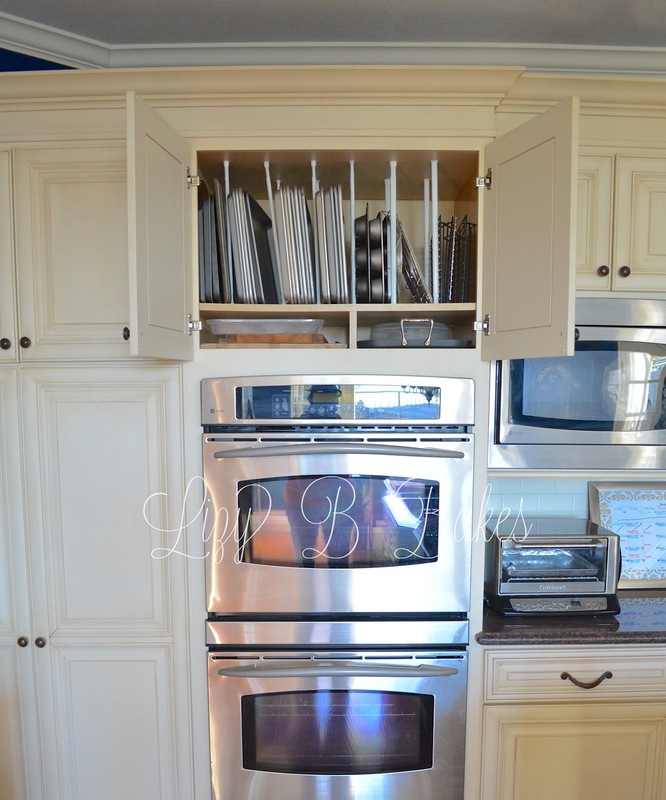 But how to do this when standard cabinets simply don’t allow for vertical storage? Stop the aggravation of the cookie-sheet shuffle by removing shelves and running tension rods from cabinet floor to ceiling. 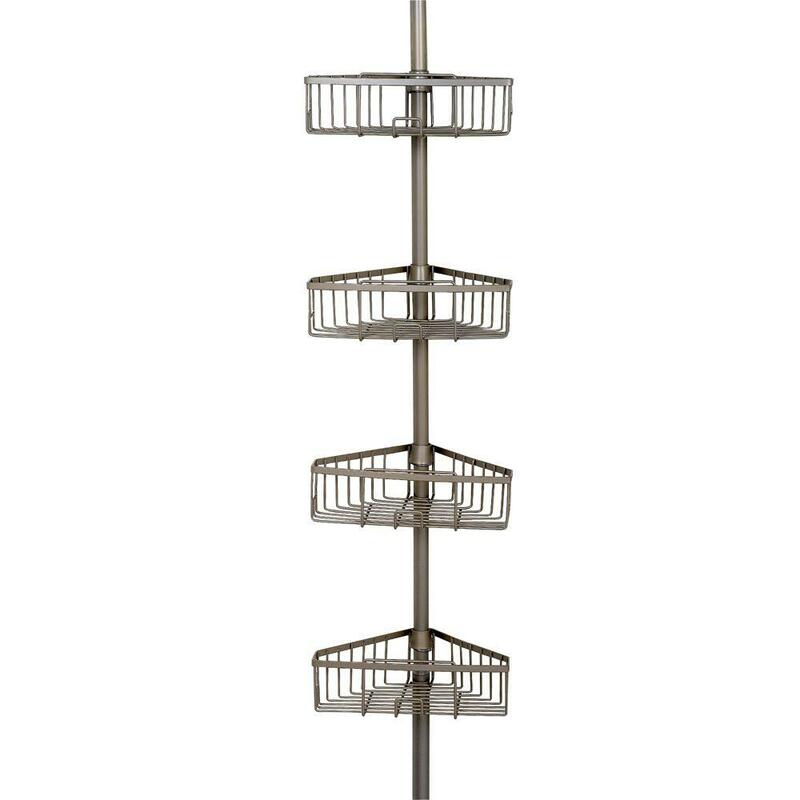 Once you’ve tried out this vertical storage, you may find you can’t imagine going back. If so, try out a more permanent solution to convert a cabinet to vertical storage. Make bath time cleanup a breeze by putting toy bins right on the side of the tub. With the added benefit of eliminating the very adult pain of stepping on a dropped toy during a shower, this simple hack is a time saver and an attractive solution to the clutter of bath toys. All it takes is a tension rod, shower curtain rings and open-mesh bins. Once you get bath toys tamed, you may be in a mood to tackle the rest of the bathroom. If so, here’s an expanded list of DIY bathroom storage hacks. One of the most common types of wood stain in the DIY community is wiping stain. Quick and easy, wiping stains are terrific, but they do result in stain rags which need to be disposed of properly. The used rags must be spread out and allowed to dry. If not, the heat generated by the drying stain won’t be able to escape, which can cause a rapid rise in temperature. This in turn mixes with the oxygen trapped in the crumpled rag, and before long, the whole pile can go up in flames. A simple way to avoid this is to place a series of small tension rods across the basin of a utility sink or other container that can stand to get dirty. Use the rods as drying racks, draping stain rags across them and allowing the stain fumes to escape as the stain safely dries. If you have more questions, checkout this DIY Dictionary post on spontaneous combustion. This tasteful and elegant coffee station blends simple design with impeccable color choices. 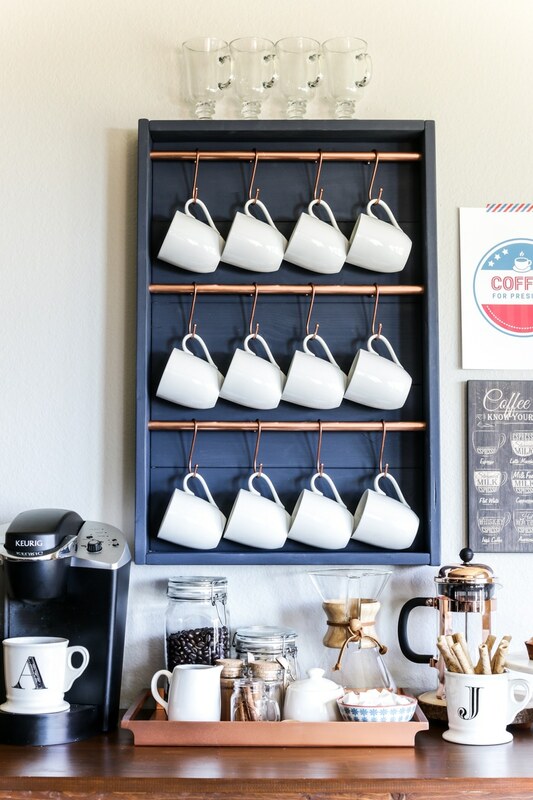 The navy blue of the frame is offset by the copper tension rods and crisp, clean white of the mugs. This setting looks great on its own or alongside other caffeinated DIY projects, such as a DIY coffee pod organizer. 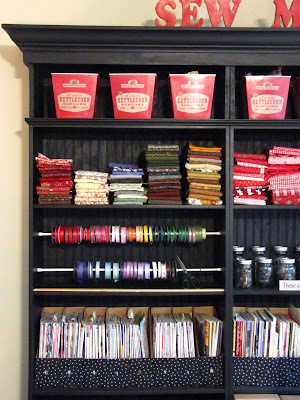 Just like a tape dispenser, a tension rod can be incorporated into a crafting station and loaded up with gift wrap or ribbon spools. Pair with some close-at-hand scissors, tape measure and straight-edge, and you’ve got a useful and tidy wrapping station. But the best thing about using tension rods? They break down quickly and easily when not in use. That makes them an ideal choice if you want to make a compact gift wrap station. Every DIYer knows to load up on paint sticks with every trip to the paint store. But what to do with all those paint sticks once they’ve been used? This fun project keeps those sticks from ending up in the landfill and turns them (when combined with a tension rod) into a whimsical window decoration. Sometimes it seems there’s truly no end to the creative twists on classic window decor! Laundry rooms are notoriously cluttered and messy, which is ironic, considering that they only exist in order to help us clean our laundry. 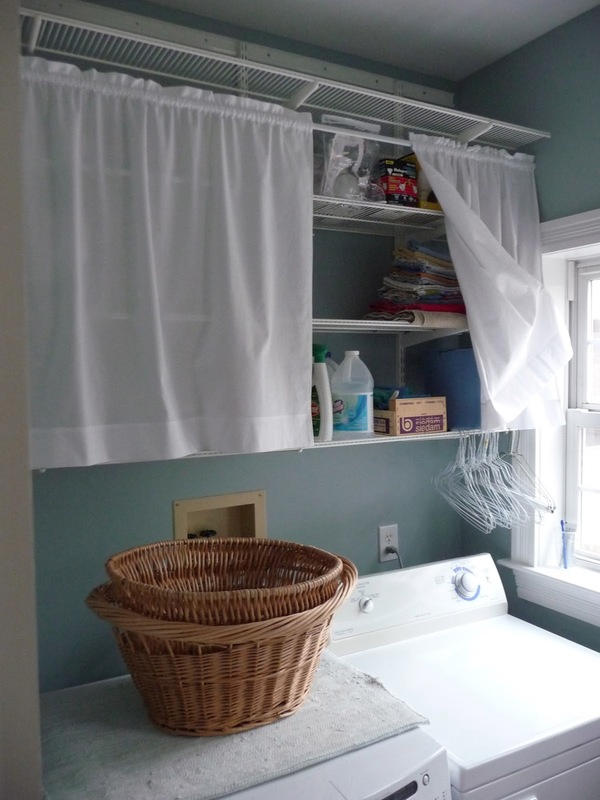 Bring some order back to your laundry room with this simple tension rod and wire shelf hack. The addition of tension- rod-hung curtains hides the simple shelving, allowing you to keep your budget as low as possible. Of course, once you get started organizing your laundry room, you may not want to stop! Before long, you may even find that you’ve converted an entire laundry area to finished space. Hanging out in the shop is one of the most enjoyable ways to spend a day, but let’s be honest: it’s also one of the messiest. Set up a tension rod to hold a roll of shop towels or a bag of rags. This is an especially great solution if your shop is in an unfinished space, as the bays between studs are the perfect width for a towel roll or rag holder. 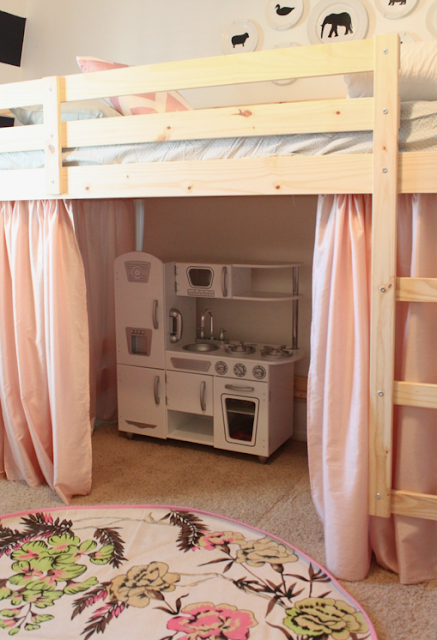 Bed lofts open up an enormous amount of floor space, but they also can look cluttered, especially in a child’s bedroom where toys can be difficult to corral. Instead of living with the clutter or constantly policing your child’s tidiness, consider using a tension rod to quickly and easily hide the mess. Out of sight, out of mind! And if you’d prefer a more ‘built-out’ look to a loft bed, take a look at this reader project for inspiration! Loose pot and pan lids can be a rattling, clangy irritation every time you open and shut a cabinet drawer. Eliminate this annoyance by simply placing a tension rod across the width of the drawer. This provides just enough space to slide in pot lids, where they will be held snugly between the rod and the drawer face. Just like that, you’ve got more space and a silent slide! If your tastes run more towards putting your quality cookware on display, here are 12 additional solutions for storing pots and pans. Set up a tension rod across the back of a closet or along a bathroom sidewall, set some handy S-hooks on it and you’ve suddenly expanded storage for jewelry, scarves and any other items that clutter up your closet. This tip works especially well for brightly colored object like jewelry or scarves, because they instantly become a focus point in the room. But there’s nothing stopping you from adapting it for other items, as well. 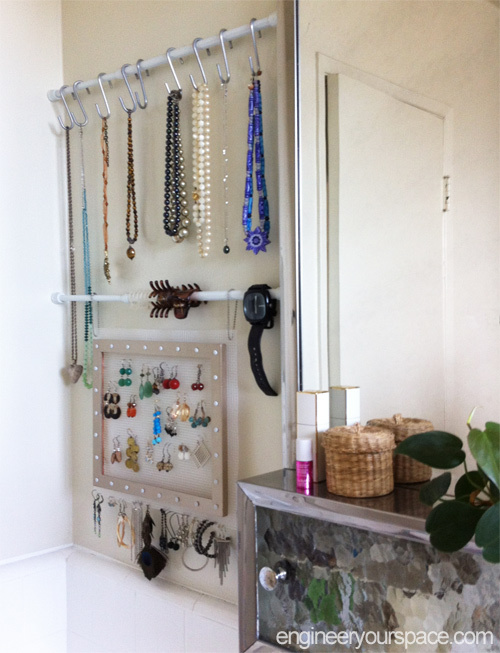 Once you have your jewelry out of the way, you might even get inspired to try out these other 15 tips for reclaiming your closet space. An under-bed dust ruffle (or bed skirt) is a fantastic way to hide the area under your bed if you want to use it for storage, or just hate seeing the dust collect down there. Luckily, you can enjoy the finished look of a bed skirt quickly and easily by running a tension rod across the frame and draping it with an attractive fabric. If you find that the bed skirt isn’t right for you, try this under-bed storage box project. Keep your furry four-footed friends from wandering through the house with this simple but effective use of tension rods. 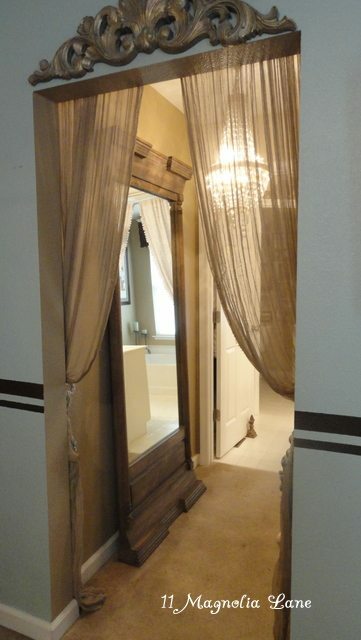 Set up a top and bottom rod, and stretch fabric between them, and you’ll have enough of a barrier to let your pet know that you don’t want them to cross the threshold. If you don’t have spare fabric, just hang several rods to create a gate with even less fuss. Of course, tension rods are not enough to keep out an especially determined pet, but it will at least be a good training aid. And if your pet gets too enthusiastic, keep in mind that you can easily repair most pet claw marks. Perfect for dividing a room into subsections, a tension rod and curtain can create a sense of privacy and make an overly large, impersonal space into something cozy and intimate. You can purchase folding divider screens, pre-built divider kits with tension rod and curtain, or take the DIY approach. Luckily, there’s no shortage of incredible DIY room dividers in the The Family Handyman archives. Protect your working space or create a worry-free drawing table for kids with a tension rod and roll of craft paper. Slip the roll of paper onto a tension rod, then place the rod between the sides of the table apron or (if the apron is too small to use) between two table legs. Pull the paper up and over the table lip, secure with a weighted item or non-marring tape, and you’ve got a durable and user-friendly paper topper. If you want a more permanent installation, here’s a tutorial for installing a more secure dispenser. If you have an open doorway in your home, or if you have an interior door that is clunky or unattractive, consider using a tension rod and fabric curtain as a divider. This solution doesn’t do much to cut down on sound, but it looks great, and can soften the feel of a room with minimal expense. If you do decide to remove a door, be sure to do it smart and safely. Winter brings rain and snow, and that in turn brings wet gloves, hats and coats. Don’t just jam those soaked items into a dark closet, bring them out of the closet so they can dry out properly! This drying line uses wire and eyelets, but simply swap out a tension rod for the wire, and you’ll have a solution to dry out gloves, hats and snow gear that won’t damage the wall where it’s installed. The items will dry and be ready for the next trip outside, and the moisture will disperse into your home’s environment, meaning that this tip does double duty. Using a drying rack is one of these 12 ways to combat winter dryness. Eye-catching window treatments aren’t cheap, and Roman shades are no exception. But with this clever hack, you can have the Roman-shade look with nothing more than tension rods and some attractive fabric. 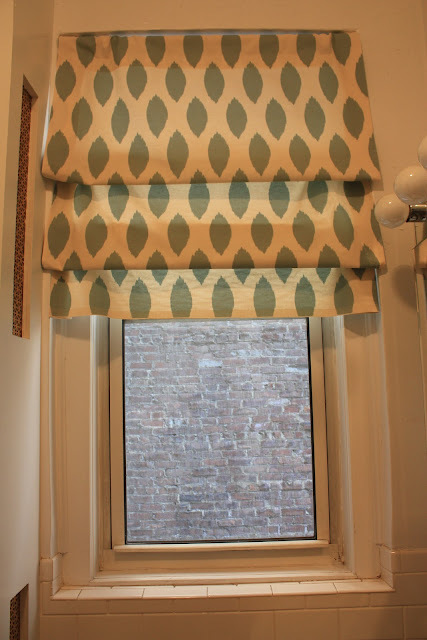 Better yet, if you use iron-on hem tape, then these window treatments become a zero-sew project! And when you’re pulling down the old blinds to hang your new shades, don’t just toss them in the trash. Here are 15 ways to repurpose old blinds. It’s a common kitchen storage problem: spice jars are only a few inches tall, but they’re often stored in a cabinet that has a full foot between shelves. That results in a lot of wasted space and lost spices. Use one or more tension rods to divide your spice storage into more useful subsections, and keep your spice containers close at hand. Here’s more detail on this clever trick, as well as 11 other cabinet storage hacks.